► recognized by the Diplomatic Courier magazine and the YPFP in Washington DC among the most influential young (Top 99 Under 33) foreign policy leaders in the world. Kader Sevinç is an honors graduate from and completed Jean Monnet European Integration Program (2005) in the Akdeniz University Antalya Turkey, pursued “business communication” training at the Harvard University and obtained her MA in International Relations from CERIS/Paris XI University with “grande distinction” (Thesis: Theories of International Negotiation, European Union’s Enlargement and the Turkish Case”). 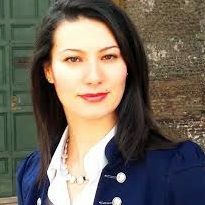 As a Visiting Fellow at Center for Transatlantic Relations/SAIS-Johns Hopkins University in 2012, Sevinç worked on the Transatlantic Relations and their implications on Turkey. She is currently a non-resident Transatlantic fellow of the CTR / SAIS. Kader Sevinç is a regular commentator on Turkey-EU, future of Europe, Transatlantic relations and renovation of politics in international and Turkish media such as BBC, Euronews, European Parliament TV, Deutche Welle, Belgian VTR, L’Echo, International Herald Tribune – Dünya, CNNTurk, Halk TV, Habertürk TV. She has written commentaries and columns for Yurt, Dünya, Radikal and Hürriyet dailies and made live daily EU news comments to “Business Channel” television. She previously worked as researcher in the Akdeniz University’s EU research center, as manager in the private sector and as political advisor from 2005 to 2008 in the European Parliament in Brussels. In 2008 she was appointed as the CHP Representative to the EU and in 2010 she was elected as a PES Presidency Council member (Party of European socialists & democrats). She is also steering committee member of the Progressive Alliance, the platform for the progressive parties all around the world. Kader Sevinç is a frequent speaker in international policy circles with experience at the European Commission, European Parliament, United Nations – New York, College of Europe Bruges and Natolin, Boston University, University of Maryland and various European think-tanks, such as European Policy Center, Henrich Böll Foundation – Europe, Frederich Ebert Foundation Europe. Cyprus crisis: A valid test for the EU Nobel Peace Prize?